Supper goes back to the field in Wolcott. As the sun sets on July's first Friday evening, take a seat amid the flowers and vegetables in Sandiwood Farm's greenhouse dining room. Sip a craft cocktail — the first one from Blackbird Bar Catering is on the house — and sup on fresh fare from Dave Dickson, David Huck and Anthony Krill of Woodbelly Pizza. Still a work in progress, the menu might include blistery flatbreads topped with early cherry tomatoes; bright summer salads punctuated with sun-kissed flowers and radishes; and pastas tossed with fresh herbs. Whatever it is, it'll be fresh; much of the produce for the meal grew steps from the table. 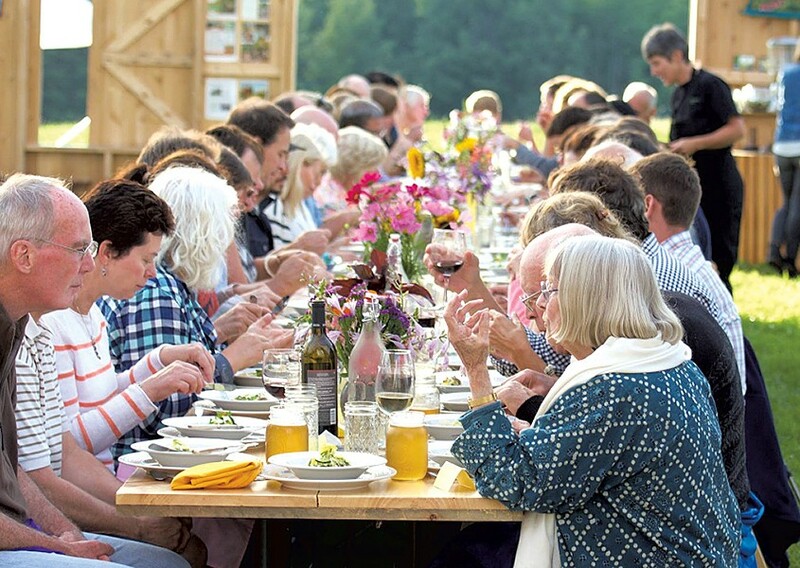 Farm-to-Fork Sunset Dinner: Friday, July 7, 6:30 p.m., at Sandiwood Farm in Wolcott. $85; reservations required. Info, 888-2881. Uncommon: Four-Course Dinner: Savor handmade pastas, fine wines and other old-world delights inspired by the Italian countryside. Saturday, July 8, 6 p.m., at the Common Man Restaurant in Warren. $55; reservations required. Info, 583-2800. Cocktail Walk: Don your pirate's cap: July's boozy, snack-fueled tour of Winooski's bar scene explores the finer points of Dunc's Mill rums. Meet up on Thursday, July 6, 5:30 p.m., at Misery Loves Co. in Winooski. $45; preregister. Info, cocktailwalk.com. Grafton Food Festival: Sip a tipple in the tiki tent or take in a cooking class with celebrity chef Sara Moulton, while your kids compete in a culinary competition. Then belly up to a barbecue or tuck in for one of several dinner events around town. Saturday, July 8, various locations in Grafton. Prices vary by event. Info, graftonfoodfestival.com. Food + Drink Features Sandiwood Farm The Common Man Misery Loves Co.